Overlooking Villa Larniano stands the Larniano cru which is composed of a single hectare vineyard planted in 1972 resulting the oldest parcel of the estate planted under the supervision of Ezio Morfini. The yield from this parcel of 46 years old is naturally low and the grapes acquire complexity and concentration that only wines with such an age could reach. The layout of the vineyard rows is of vital importance. In the Larniano cru the rows are planted perpendicular to the direction of maximum slope in order to allow the summer rains to penetrate slowly into the soil, rather than run off violently. 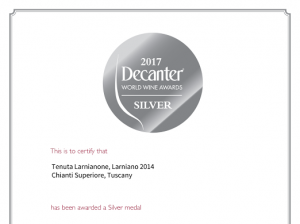 Chianti Superiore Larniano is composed only by the finest Sangiovese, Canaiolo and Colorino grapes carefully selected from the Larniano cru. After the malolactic fermentation concrete vats the wine is aged for 18 months in premium hungarian tonneaux. After the success of Chianti Santa Virginia, which was elected as the top wine in the “Chianti Docg” category by Decanter for the vintage 2013 and 2015, the Morfini family decided to produce a unique wine, limited to just 1000 bottles, selecting only the best grapes of its most qualitative estate parcel: The result represents the state of the art of the Tenuta Larnianone’s craftsmanship of wines.